FEARLESS AWARD – Collection 29 | Karol R.
Un Fearless Award pour la collection 29 ! Voila la super nouvelle de ce matin ! Un grand merci à Sandrine et Clément ainsi qu’à Fearless Photographers. Don’t find ballroom dancing sufficiently challenging? Try it on piggyback! 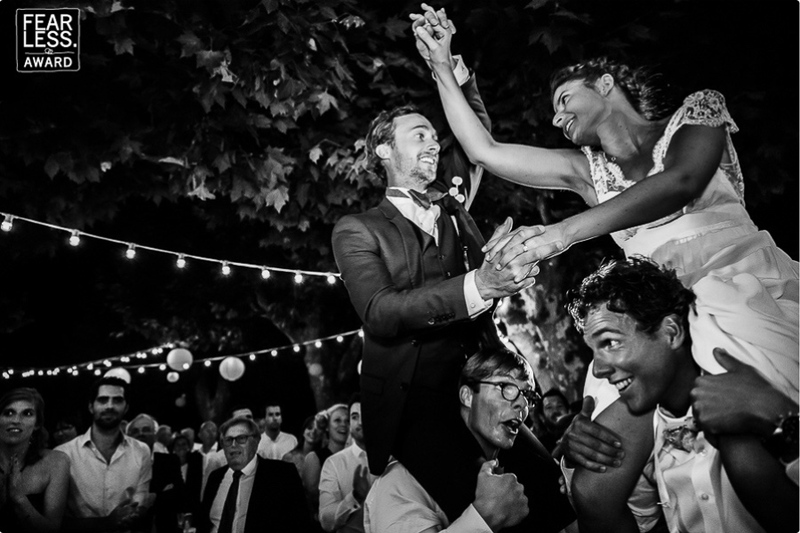 Shooting a wide view from a low angle allowed the photographer to capture all the tiers of activity—from the funny expressions on the men carrying the couple, to the reactions of the crowd in the background, to the smiling faces of the interlocked couple. We even get a sense of the venue and decor, making it a wonderful all-in-one reception image.